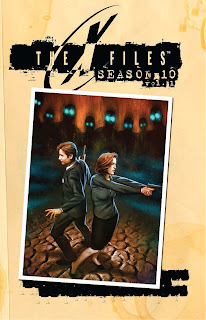 Joe Harris's X-Files Season 10 Vol. 1 (not apparently called "Believers" despite that it's the title of the story) is not a perfect book, but it's as good a fictional opener for a new X-Files season as fans might hope. There's nary an aspect of fan service that Harris doesn't run straight in to; while this might make the book somewhat predictable, it's no more or less so than knowing whether that night's episode was a "mythology episode" or not based on the names in the opening credits. If X-Files were coming back, this is what fans would want, and as a fan I'm very eager for Harris's second volume. I read "Believers" just after a re-watch of the second X-Files movie, I Want to Believe. Like the movie, "Believers" takes as its purpose to reintroduce Mulder and Scully, again after an absence (though fans can rest assured "Believers" is far more mythology-driven than I Want to Believe); the darkness finds them again, as the last movie discussed, with Director Skinner showing up at their door instead of FBI agents in need. I Want to Believe had its touchstones, like the pencils collected in Mulder's ceiling; in "Believers," Harris gets in a "Spooky" Mulder reference as quickly as humanly possible. This is, again, fan service, but an X-Files revival comic ought have no higher purpose than nostalgia anyway, so what might seem blatant is at the same time effectively cute. Harris's second and third chapters are more back-to-back fan service, with the one-two reintroduction of both the Lone Gunmen and the Cigarette-Smoking Man. Putting these "resurrections" so close together does make this part of the book feel sensationalist, as if Harris felt he needed an "explosion" every issue; fortunately Harris refrains from bringing back Krycek in the fourth issue or a Samantha clone in the fifth, though I think we can all assume those are coming one of these days. I actually rather liked Harris's reintroduction of the Lone Gunmen. Instead of making it a true "resurrection," Harris posits that the Lone Gunmen have been alive all along, and that Mulder and others knew about it, it just didn't rise to the level of the audience being made aware of it. Sensationalism abounds here, but I appreciated that Harris went lower-key in this aspect. Equally the implication we get that the Cigarette-Smoking Man has been resurrected through some amount of alien DNA being grafted to him is perfectly plausible within what was established on the show. Artist Michael Walsh brings a stripped-down style to the book, I would imagine an X-Files comic having an artist who draws with more detail, but Walsh's images are nicely sparse with a hint of grittiness, reminiscent of Michael Lark. Walsh's sparseness also allows for him to suggest the facial features of the X-Files actors in his depictions, without making the characters look forced or photo-traced. About two-thirds of the way through "Believers," I began to feel that this story needed a big ending. There are plenty good X-Files-authentic moments in the story -- most notably the cliffhanger where Scully thinks she's shot a shape-changer that looks like Mulder, only to find out that it's Mulder himself -- but also a lot of talking and running around, which suggested to me "Believers" would be a quieter, I Want to Believe-type story rather than a Fight the Future-type blockbuster. In the end, however, Harris doesn't disappoint, with a spaceship launched into the air reminiscent of the flash of light in X-Files's pilot or the end of I Want to Believe. While satisfying, the ending is perhaps too similar to X-Files stories previous; also I didn't think Walsh quite captured the scope of the spaceship in the way Fight the Future's ending did, for instance. Perhaps the truest sign that Harris's book has successfully recreated the X-Files vibe is that the end doesn't make a lot of sense. There's a lot of double-speak here about the Bringer and the Favor and the Cradle that's never fully explained, letting alone who's working with the alien cultists and who against them. Even when the Cigarette-Smoking Man was explaining this latest alien conspiracy, I had to read it all twice. This might be a detriment in some books, but X-Files fans know it took years and years before we understood what was going on in the show; I appreciated too that Harris does not dumb the story down for comics, but rather trusts the reader to keep up as best as possible. The kicker is one of the book's closing scenes in the FBI boardroom. More than the Cigarette-Smoking Man showing up or Mulder and Scully chasing one another through the woods, Harris's use of the boardroom is classic X-Files; how many times did we see Mulder and Scully in there, getting dressed down by their superiors or alternately resigning and regaining their FBI commissions? Here, Harris delivers the ending that I Want to Believe did not, fully restoring the old status quo, and that's probably what X-Files fans have been waiting for most of all. I read X-Files Season 10 Vol. 1 in one sitting; enough of the panels are large enough, and the dialogue sparse enough, that this is a book that passes quickly, if still satisfactorily (my eagerness to read it might also have been a factor). At no time did I think writer Joe Harris presented any of the X-Files cast out-of-character; undoubtedly he's got a good sense of the series, its tropes, and voices. All in all the new X-Files series is just what we've been waiting for; the second collection can't come soon enough. Perfect review! I felt jut the same way! I haven't posted my review yet but you've said the same as me (only better!) I was giddy to find the Lone Gunmen return and looking forward to more of Cancer Man's involvement. It was pure fan service and I enjoyed every page of it. Can't wait for volume 2.